Catapult Creative Labs vice president and managing director George Sass makes a presentation Wednesday to exhibitors at the METS Trade Show. Sass’ presentation was part of a session that informed METS Trade Show exhibitors and attendees about Active Interest Media marketing arm Catapult Creative Labs and offered tips to those interested in marketing their marine products and services in the United States. The session began with remarks by Dean Waite, publisher of Soundings Trade Only, a sister company to Catapult Creative Labs within AIM. Soundings Trade Only is a longtime METS Trade exhibitor and sponsors the new METS Trade Theatre. Waite introduced George Sass and Jonathan Dorn, who is AIM senior vice president and senior vice president digital and creative services for Catapult. 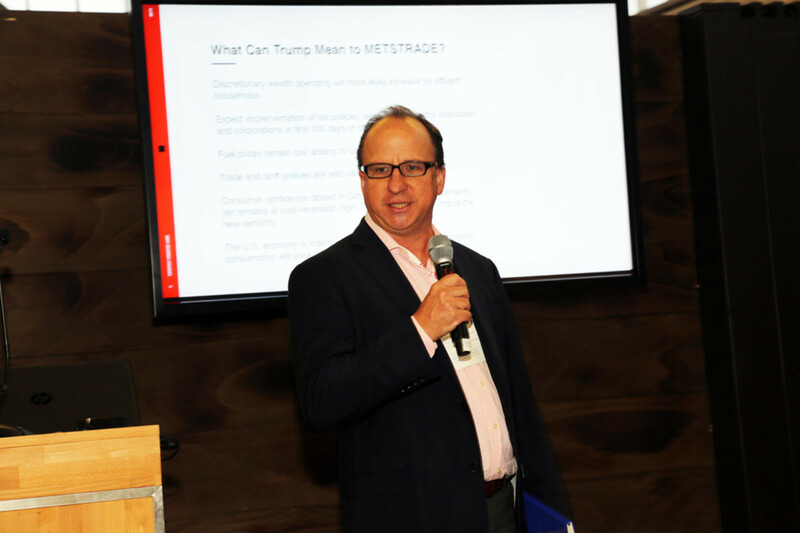 Sass, who prepared his presentation by polling Catapult clients about U.S. President-elect Donald Trump’s likely impact on the American marine marketplace, opened the session with several predictions about the Trump presidency. However, he said Catapult’s clients largely were optimistic about the boating market in the near future. Dorn then took the stage to formally introduce Catapult Creative Labs, which offers an extensive suite of data-driven marketing services, including crafting custom content, video and TV production, lead generation, creative services, event activation, social audits and strategy, and research and data services to clients within and outside the marine industry. Drawing from his own experience and that of the Catapult team, Dorn offered insights to the METS Trade audience about the differences between marketing to the U.S. and European marine markets. “The absence of wholesale distribution exclusivity increases the importance of marketing to the end consumer,” he said, stressing that it is essential to go to multiple boat shows, both trade and consumer, instead of relying on a single show. Catapult specializes in mining its vast data resources to craft customized, regionally specific, engaging marketing content for its clients. “We create on-message content that educates and entertains,” Dorn said.